The 26th annual international conference of the European Forum for Vocational Education and Training (EfVET), which was held in Thessaloniki from 25 to 28 October, focused on ‘aligning work and education to the future’. Over 220 training providers from across Europe and guests from Hong Kong, the USA and Canada took part in the conference. In his keynote speech, Cedefop Director James Calleja said that businesses and the different stakeholders assist one another in defining short- and long-term skill needs locally, regionally and at European level. He stressed that the relationship between businesses and vocational education and training (VET) providers is a necessity for both, as lifelong learning is part and parcel of the future of work and of VET. Mr Calleja added that evidence from Cedefop research shows clearly an increasingly beneficial connection between work-based learning and employability for learners, workers and employers. one needs to improve feedback loops between businesses and stakeholders through efficient communication channels so that all speak the same language. Speaking again at the end of the conference, Mr Calleja stated that the challenges of VET and employment are the same; advancements in technology, automation, demographic changes and new forms of learning give VET a new profile of excellence and inclusion, and work environments the necessity to create learning spaces for their employees throughout their careers. The divide between learning and working is gradually closing down, he added, as no one can afford to stop learning. VET providers cannot deliver ready-made human capital and employers cannot afford to have low quality if they seek to be competitive. This dual role creates a new bond between the world of education and training and the world of employment, with employees benefitting from workplace and lifelong learning. 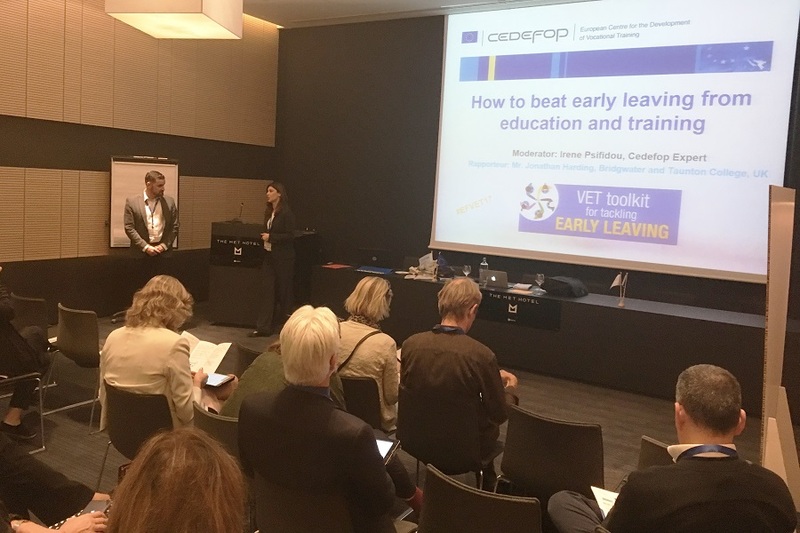 These innovative tools and actions are available to policy-makers and VET providers through Cedefop’s VET toolkit for tackling early leaving. This new toolkit was presented in two workshops organised and moderated by Ms Psifidou. She invited participants to take a leading role to tackle early leaving from VET by becoming an ambassador and represent their country, region or city at the Cedefop toolkit. The call for ambassadors is open to all those interested in sharing good practices and tools they are involved in or aware of. 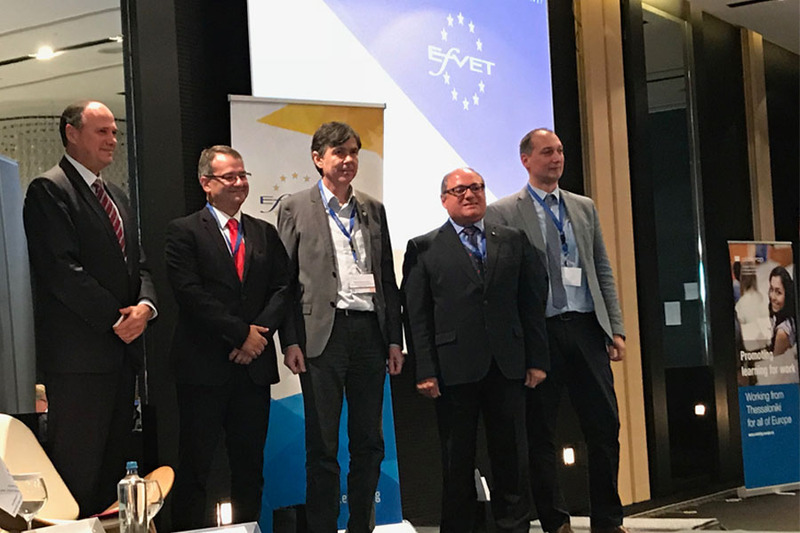 EfVET is also an important stakeholder of the VET practitioner community set up jointly by Cedefop and the Platform of European Associations of VET Providers in 2017. The community was created based on the Cedefop conviction that VET providers are the only ones able to bring about changes at grassroots level; hence their voice should be as important as that of the other three institutional stakeholders (national authorities, employers and trade unions). The community aims to define by 2019/20 practical guidelines for providers and suggestions for the European Commission on integrating and empowering migrants and refugees through learning, enhancing the e-skills of teachers and trainers, and promoting the EU mobility of teachers and providers. The community is divided into three subgroups, each working on one of the priorities above. EfVET Secretary Rasa Zygmantaite chairs the mobility subgroup. Together with Cedefop expert Tina Bertzeletou and Head of Department for VET Systems and Institutions Loukas Zahilas, they presented the community and invited conference participants to join. Mr Calleja also addressed a workshop at a work-based learning multiplier event on the margins of the EfVET conference. Cedefop’s work on monitoring work-based learning was presented, with results showing encouraging initiatives throughout many EU Member States in: reforming or introducing apprenticeship, practical training in school-based VET, involving stakeholders across the board and developing entrepreneurial education.